Today we look at the best of vintage British Motorcycles from five of the biggest manufacturers — Triumph, BSA, Norton, Vincent, and Ariel . All motorcycle connoisseurs have their favorites. It’s part of the nature of motorcycling, that certain folks like certain kinds of bikes. I know several guys who never owned anything but Harley Davidsons. I personally have owned makes from the U.S., from England, Japan, and Germany. And I have to say, there is something very special about an English motorcycle. A reader of mine stopped in and commented recently about how she learned to ride on British made motorcycles….. I think a lot of us today look at the ready availability of Japanese bikes of every size and description and forget that it wasn’t always like that…. That BSA, Triumph, and Norton actually sold many more bikes in the sixties than did Honda, Yamaha, and Suzuki. This reader happened to have cut her teeth on two of the great British bikes of the decade– the Triumph Bonneville , and the Norton Commando. I replied that I had learned on a friend’s BSA Triple ( ummm.. not one of the best bikes ever, but certainly a great period piece ) and that it was a pleasant surprise to find someone else who appreciated Brit Bikes. I think it’s a mark of good taste, for certain. Now, some of you might be saying that Brit Bikes always seemed to require a bit more attention…, a bit more tweaking…., and a lot more retightening all the time. Yes, they didn’t seem to be all that well constucted sometimes, but when you got a good one, well……………………………….. watch out, baby. and nothing made a better chopper than a Triumph . ………….. nothing was faster than a Vincent Black Shadow. HRD was a British motorcycle manufacturer founded in 1924 by Howard Raymond Davies, who had done some motorcycle racing and wanted to develop a more reliable bike for that purpose. The company had some difficulty penetrating the market, and in 1928, the company ended up in the hands of a motorcycle designer, Paul Vincent, who called the new company ‘Vincent HRD’. The earlier HRD bikes had a racing pedigree, and Vincent decided to build on that. At first, the Vincent HRD’s used a single cylinder JA Prestwick (JAP) engine built on a Vincent cantilever frame… but after a very bad showing at the 1934 Island of Man Tourist Trophy races, Vincent switched to engineering their own engines. This proved to be an excellent decision. Chief engineer Phil Irving had been developing several novel concepts, and Vincent HRD put them into production. These included the three wheeled “Bantam” , the groundbreaking single cylinder 500cc OHV “Meteor” engine, and the 998 cc, 47.5 degree V-Twin with 6:8:1 compression – the 1936 Series A Rapide. After WW II, Vincent HRD entered the American market, abandoning the HRD labelling in order to avoid confusion with the largest selling American brand Harley Davidson logo (HD). In 1948, Rollie Free exceeded a speed of 150 MPH on the Bonneville Salt Flats on a specially modified Vincent Black Lightning. 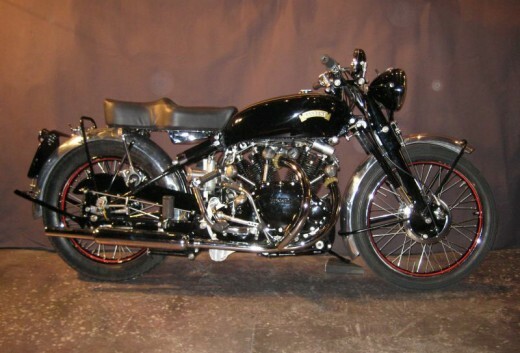 The Black Shadow, with a series-c 998cc V-Twin Rapide engine, produced 54 horsepower and 125 MPH. The Black Lightning, with a mostly aluminum V-Twin, lightweight racing version of Black Shadow. The Comet, and the Meteor, with single cylinder 500cc engines, along with a racing version the Grey Flash, with an Albion gearbox. and the high-end Black Prince, an upgraded Black Shadow also with the weather enclosure. The last Vincent motorcycle came off the production line in December, 1955. 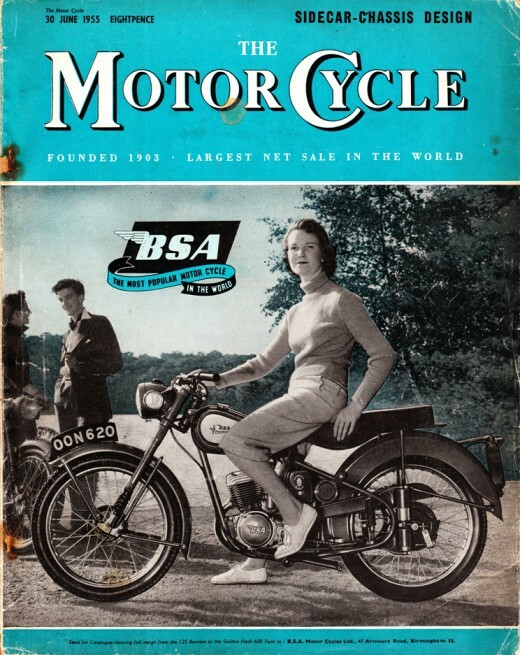 BSA — Birmingham Small Arms Company, produced a full range of motorcycles between 1910 and 1972. They produced their first all-BSA model, with 3 1/2 hp, at the 1910 Olympia Auto Show in London, and subsequently sold out their lines the next three years. They had bought British Daimler for automobile engines , and some of the plant was put to work on motorcycle engines. Soon, in 1919, they were to develop their 50 degree V-Twin 770cc side valve Model E.
The line steadily improved throughout the pre-war era, and several models of varying size and power were offered, from a “B series” 249cc, “R” series 399cc, “W-series” 499cc, “M-series” 596cc, “Y-series” 748cc, “E-series” 771cc, and up to the “G-series” at 985 cc. 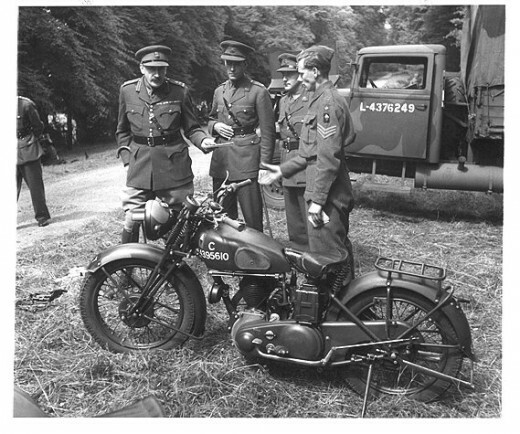 BSA produced more than 120,000 M-20 500cc and M-21 600cc motorcycles during WW II. After the war, BSA saw a boom in demand, and they soon acquired several smaller motorcycle companies, including Triumph, Ariel and New Hudson, to help meet the production needs. BSA also manufactured the Dandy, Beagle, and Sunbeam brand scooters. The last English made BSA badged motorcycle came off the line in 1972. Triumph is one of the only pioneering manufacturers of English motorcycles still extant. ……………. and are currently producing a beautiful range of excellent motorcycles. … but the first British made Triumph was produced in Coventry in 1904. …. and the company’s history is a bit on the convoluted side. Suffice to say that the Model H Roadster— “The Trusty Triumph” made the company’s reputation for quality, and the company grew quickly after the war. ….. and this bike served as a basis for all Triumph Twin models until 1981. Also around this time, a lighter and faster 500cc machine, the Triumph Tiger 100 , with a top speed of around 100 mph, made its’ appearance. The Coventry plant was destroyed during the Blitz ( as was most of Coventry) and post war production was relocated to the West Midlands. This powerful little bike proved very popular with American customizers of the time….. In 1955, a specially modified Thunderbird with a GP racing type twin carb head, dubbed the “Wonderbird”, held the speed record for motor cycles until 1970. A stock 1950 6T-Thunderbird was also the bike that Marlon Brando rode in the movie “The Wild One” . …….. and !voila! hence came the famous Triumph Bonneville . The parallel-twin four stroke 650cc engines on the Bonneville T-120, and later the 750cc on the T-140, were both durable and powerful, and Bonneville soon became the best selling Triumph model in the American market. ….. and many of us mature bikers here in the States remember that bike almost reverently. Ariel, based in Birmingham, started selling motorcycles in 1902, with their first model producing about 2 hp from a 239cc two stroke Minerva engine. Several improvements were made in the line until, in 1910, a 498cc White and Poppe 4 hp engine, originally made in Coventry, and then in-house, was used, and proved so durable and powerful that it was a mainstay of the Ariel line for 15 years. In the 20’s, engine offerings increased , with a 249cc, 586cc and a 992 cc added, along with drum brakes, hardier wheels, and enclosed chain drives, to replace the belt drive of previous models. Another engine introduced around that time was Edward Turner’s concept for a big OHC four cylinder design called the “Square Four” , an idea that had been previously rejected by BSA, and it was used on a Ariel bike of the same name. This engine caught the attention of the motorcycling world , and the square four engine would become synonymous with the Ariel line. 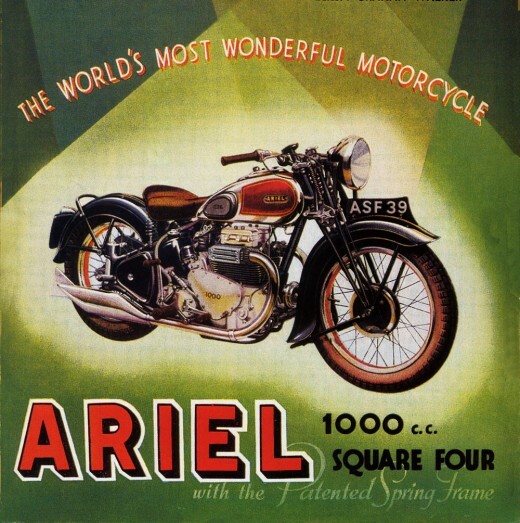 One thing was obvious from very early on, Ariel Motorcycle would be about large bikes, and powerful engines. Their most popular bike in the thirties, however, was called the “Ariel Red Hunter” — a nimble single cylinder, dual valve, OHC sport bike offered in 250cc, 350cc, and 500cc configurations… the 500cc could develop about 25hp , with a top speed of 85mph. The Red Hunter sold so well, Ariel was able to purchase competitor Triumph. During WW II, over 42,000 Ariels were produced for the war effort, including the “W/NG350” . 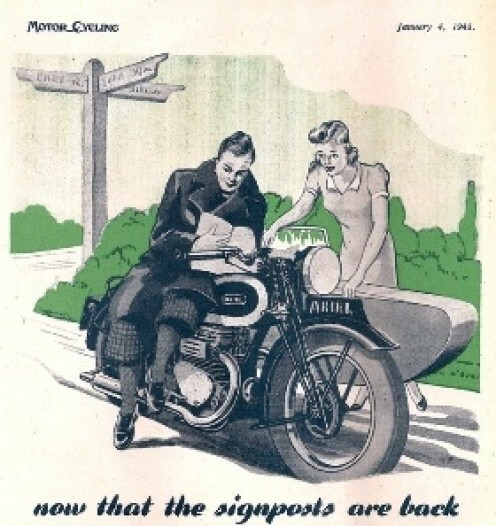 In 1944, BSA acquired Ariel, and continued manufacture. 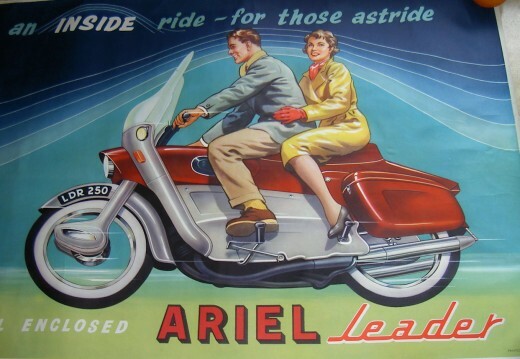 In the fifties and sixties, Ariel’s technology was outdated, their styling looked old fashioned to many, competition was very tight, and popularity waned. They produced several smaller displacement bikes during this time, “Ariel Leader” 250cc, between 1958 and 1965, and also a 250 cc “Golden Arrow” in 1963. The newly designed 1958 “Ariel Leader” was a beautifully thought out machine, with wrap around panels that concealed much of the workings, and looked almost too modern — it came with full instrumentation including a clock, and an integrated windscreen. The enclosure panels were not new to English motorcycle design– Vincent’s “Black Prince” used a similar setup, but the Ariel had a sharper look, and offered an interesting array of colors, including red or blue offset with gray two tone paint schemes. This bike might have done well if plans for models with larger displacement engines had come to fruition… as it stood, it won the award for 1959 “Motorcycle of the Year“. This aspect of Ariel’s history — the potential the company might have had — fascinates many contemporary motorcycle enthusiasts like me , who find the old big-displacement Ariels appealing but unobtainable. Ariel made their last motorcycle, a 200cc “Ariel Arrow”, in 1967. Like Ariel, Norton Motorcycles were also built in Birmingham. Like Triumph, Norton Motorcycles has had several reincarnations. 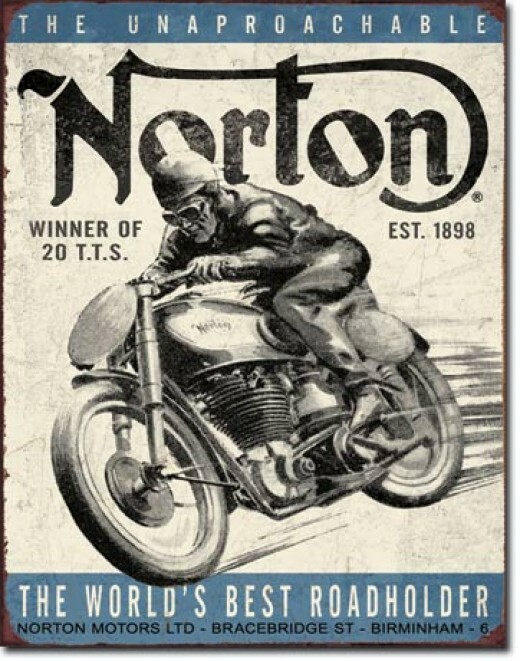 Unlike most English motorcycle manufacturers though, Norton’s most popular and innovative bikes came after World War II. … it started making motorcycles in 1902, using French and Swiss made engines. Norton made its own engine starting in 1908 – one cylinder, side valve, 2 hp. In 1922, Norton developed a motorcycle nicknamed “Speedy” — a 490 OHC “Model 18“, capable of nearly 100 MPH. Development, initially slow, sped up with the development of that first overhead cam engine. It was perfect for the Norton “CS-1“, a TT racing-bred sled that made about 25hp with the 490cc. Soon behind that came the “CJ-1“, with a 350cc OHC. Starting in the 1930’s, Norton had excellent results in the motorcycle racing circuits with these bikes, winning the Isle of Man Senior TT seventeen times before 1955. During World War II, Norton production focused on the “16-H” — a 490cc single cylinder, four-speed model of which over 100,000 were made, and designated “WD-16H” — these bikes were highly prized for their endurance and high ground clearance. After the war, Norton continued production of the “16-H” and the “Model 18” , adding telescoping forks, adjustments to the suspension and updating the style a bit. Norton released it’s twin cylinder 500cc pushrod “Model 7” in 1949, although this bike is better known as the “Norton Dominator” . The “Dominator” was designed to go head to head with Triumph’s “Speed Twin” — and set the design tone for Norton twins up until the 1970’s. A “Dominator DeLuxe” was released as a “Model 88” two years later, but this bike was plagued with quality control issues . 1957 saw the release of a new 600cc “Dominator” on a new “Featherbed” frame- called the “Model 99“, with alloy hubs, upgraded brakes, and 31hp. This was followed in 1961 by the “Dominator 650SS” cafe style bars and dual carbs. Norton seemed like they were on a roll . But financially, they were not doing well. Norton had been sold, in 1953 to Associated Motorcycles Company (AMC) , who already owned AJS and Matchless ….. In 1962, AMC closed the Norton plant in Birmingham and moved production to Woolwich, London. They attempted to modify their vertical twin engine for a 750cc to compete in the American market, but this didn’t work out too well…. vibration on models like the “Atlas 750” became intolerable. 1967 saw the introduction of a viable 750cc Norton — the Norton “Commando” . Despite several recurring quality control issues, this bike is still very highly regarded for it’s cutting edge frame design, raked appearance, and power to weight ratio. One hundred years from now, this motorcycle– the Norton Commando 750– will still be rated as one of the best by riders of vintage machines. And it’s a worthy way for the Norton Motorcycle Company to be remembered. The 850cc Mk-I version of the “Commando” was released in 1973.. raised the horsepower a couple of horses, and cut into the gas mileage, but was the last gasp of the old Norton company, and the last Commando (Mk-III 850cc) rolled off in 1975. A company called Norton Motorcycles UK – based in Donnington Park ( home of the famous race course) is building three models of motorcycles called “Commando” which were designed by Simon Skinner — and using a 961cc fuel injected OHV twin– these include a cafe racer, a sport model and a full size cruiser called a “Commando SE”. Now, check out my WP post on the Early Development of Motorcycles here. Or check out my buddy CrocodileJock’s link to British Made HESKETH bikes. 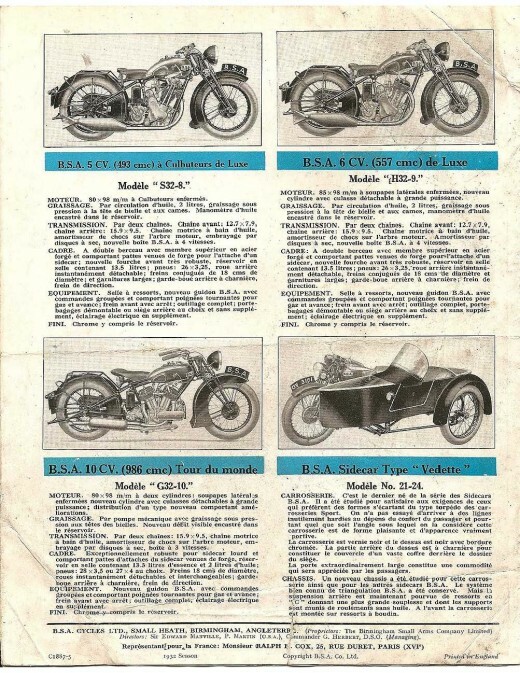 This entry was posted in History, Motorcycles, technology, Uncategorized, Vintage and tagged Ariel, Black Shadow, British, British Made, bsa, Commando, English, Motorbikes, Motorcycles, norton, Triumph, Vincent. Very welcome … someone is still actually using the thing … and has added a few modern things so my hubby tells me .. not being an expert on motorbikes I couldn’t say … but seeing your post today, I remembered snapping the photo the other morning (and never thought I’d find a use for it!). Yes, it’d be a shame if someone wasn’t riding it… I hate the idea of a bike like that sitting in a garage or a museum. I agree … it is so cool that someone took the bother to fix it up and is still using it! It’s definitely worthwhile — that Moto Guzzi is a great riding motorcycle !!!! I actually, or rather my ex owned one years ago when we lived in Asmara, Eritrea … except for all the crap it spit out of the exhaust pipe it was a great bike. Probably the fuel .. that was back in 74 … and the stuff that came into the country probably was cruder than it should have been … climate was cool … eternal spring on that plateau. 🙂 Sounds lovely– plenty of water/vegetation?? Nope … well … that is there’s plenty of water as in there’s no water shortages that I know about, but it’s on a high plateau, so not much vegetation … except for a tree farm, which I’m not even sure still exists – since I lived there, there’s been a revolution and a civil war. I sold my bike a few years back (tough times, had to pay the rent *heh*) and I didn’t have the need for motorbike speed until I read this post. *thanks a lot* 😜 I’ve been partial to Hondas and BMWs but English bikes have always had a certain allure. New to your sight so this is way after the post (always late to the party…lol). Anyway, I saw this post and had to comment anyway. 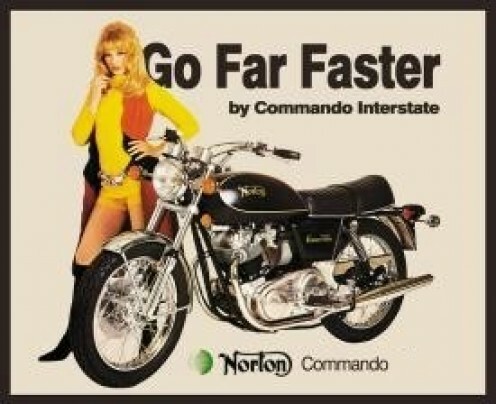 I have a hand shaking knowledge of a Norton Commando that was a semi permanent resident on the back porch of our house for years. We lived on a farm at the time and I was eight months pregnant with my son. I will never forget the dark evening that there was a tornado warning and found myself helping to push that bike over the door step and into the kitchen before we headed to the basement. That memory just put a big grin on my face. Never got it running, but we sure did love that bike…it was like a piece of precious artwork. Thanks for sharing you love of bikes and giving me a big smile this morning. It sounds like you are a person of excellent taste in motorcycles — that Commando was a wonderful bike. It’s a shame you never got to ride it — and you’re so right — it was art in motion. Thank you for your comment – I appreciate it !!!! I think I may have heard of a few of those bikes. I can say that my mother and father-in-law had a bike with a side car that they would put my baby sister-in-law in after the war. Good post. Brings back memories. Had a 48 Harley, suicide clutch, back in the 82nd, in Fort Bragg. Traded it in for one of the first Aerial Square 4’s. When I brought it home to MN I could not believe the hatred it caused by all the Harley riders up here. But I really liked that bike. About ten years later every other bike up here were Triumphs. Another good bike. One good things about owning a bike back in the 50’s and 60’s, you didn’t have to wear a Tshirt with the bike’s logo on it. thank you for the repost !!!! cheers! Yes. some really wonderful bikes are in that post. Thank you for commenting– Cheers! Thank you for the linkback — cheers !!!! …. and that the original company became part of Norton Villiers Triumph in the 1960’s. excellent !!!! I’ve added the link to the post– cheers !!!! Excellent, interesting and informative post. Some fine machines here, always had a regard for these bikes. Although my own passion, the Italian motor scooter was partly responsible for the demise of the British bike industry… Themselves superseded by cheaper, reliable bikes from Japan… Their IS something very special about the British motorcycle. oh, yes… and the Italian bikes certainly did contribute!! Cheers!! I’m glad you enjoyed it. I like the Triumph line a lot– they market a bike called the Rocket here, which is wicked fast and looks great. Good luck with the Triple! Thanks. I’ve been browsing our posts, do you have an about page or the first post..? Awesome post, you really were all inclusive and so interesting! Thanks for the great read! 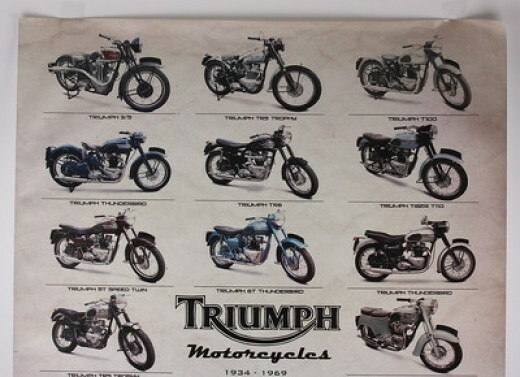 What a great vintage British motorcycle collection! I really enjoyed this! Thanks! I’m glad you enjoyed the post — Brit motorcycles have always held a special place in my heart. A lot of info here. I never realized that motorcycles were quite so popular.